Being different has been historically viewed as a negative. Whether it is a birth feature, a behavioral difference, or a matter of a choice of style…people tend to critically view these things and shun them. I submit to you that we were each uniquely designed to stand out with respect to individual purpose, yet be on one accord in heart. At the tender age of 2, I must have grasped ahold of this notion of being born to stand out. I had even found another way to spell “out”. Despite hearing my grandmother say: “O-U-T, OUT!” I’d discovered a way to spell it that had a different ring to it: “O-T-T, OUT!”. Soon I discovered that I was in error 😊. However, as time progressed, I found myself participating in spelling bees with children who were older than I. This was largely in part because I was afforded the privilege of taking classes with others who were in a higher grade until I reached the 2nd semester of my 3rd grade year; at that point, I was skipped to the next grade. While everyone was not as welcoming of this privilege, I’m truly grateful. As a member of the body of Christ, I may be an eye. I say this because it’s been my experience to see something that may otherwise be insignificant and I get an encouraging message from it. This particular writing is an example of one such experience. Below is a picture that I took to capture the moment that would later develop into this writing. 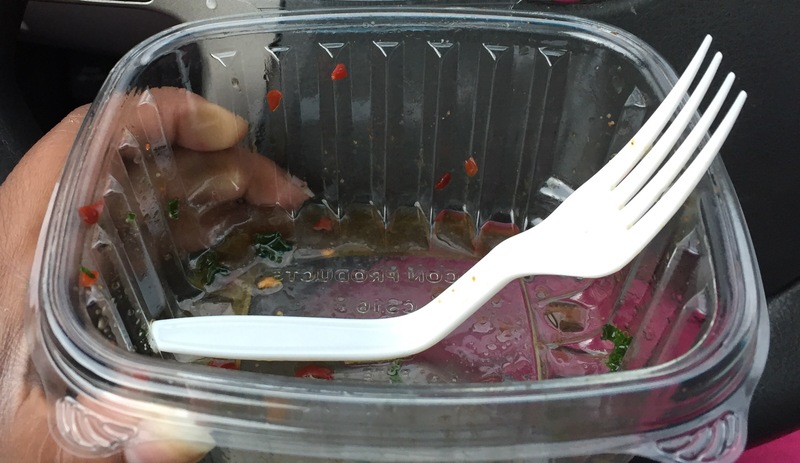 While in my vehicle, after having finished a delicious portion of spicy kale, I looked for a bag to dispose of the trash. I typically keep one in the car, but on that particular day I didn’t have one. In an effort to try to make the trash more contained, I attempted to bend the fork I was using so that it would fit in the container. I was unpleasantly surprised at how strong this fork was; I was trying to get this container sealed and was encountering all types of resistance from the fork. I bent it and turned it in so many directions…to no avail. At that moment it occurred to me: the fork wasn’t designed to fit in that container and that’s why it was standing out! Immediately, I said to myself: “Self, you have to take a picture of this and share about being designed to stand out.” I had no idea what I’d write or when I’d write it, but I got up early this morning and began to type and this message is the result.